100% Coconut Shell Charcoal is our one and only formula. We make sure to select the finest quality coconut shells from over than 20 islands in Indonesia, and we make sure that we produce them according to the highest quality level to make a product that earns the respect of our valued customers. Click on "Add to Cart" button to add items. Coconara Quicklight is the only quicklight charcoal with no taste. Coconara did it again in producing the best quicklight charcoal on the market! Tasteless and burn up to 60 minutes. You can light these coals easily with a cigarette lighter or torch lighter and are fully lit in less than a minute. 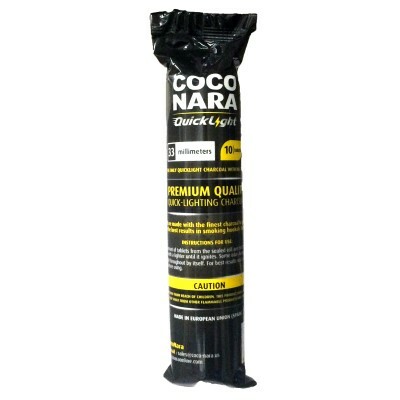 Coconara quicklight hookah charcoals are quality clean-burning hookah coals manufactured in Spain. Success is the result of perfection, hard work, learning from failure, loyalty, and persistence, all with an open positive mind. They say keep your thoughts positive because your thoughts become your words. Keep your words positive because your words become your behaviors. Keep your behaviors positive because your behaviors become your habits. Keep your habits positive because your habits become your values. Keep your values positive because your values become your destiny. We, like many who proceeded us, have carved our destiny with our own hands and engraved it in stone, and we still do, every single day. Since 2005, our expansion has been progressive and our charcoal map has been expanding yearly if not monthly, and we are making the world shift to the Cube. We have been expanding in the Middle East and the Gulf region, in Africa, Europe, Russia, in USA and many other growing markets.